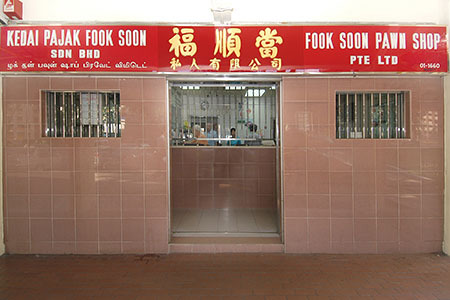 Fook Soon Pawnshop is the oldest pawnshop in Ang Mo Kio and has been around since 1977. It is located near the Ang Mo Kio Mrt station / Bus interchange and is only a 10-minute walk away. With over 35 years of experience, you can rely on us for a fast and reliable loan. Get a higher pawn value for your gold and whie gold jewelleries (with or without diamonds), Rolexes and luxury watches, as we are situated a bit away from the bustling Ang Mo Kio centre. Take advantage of our discrete location and park easily in the numerous car lots in front or at the back of the shop. Enjoy peace o mind knowing that your valuables are kept safe behind stainless steel grilles and within a monitored vault and that we will call or send a reminder letter when your pawn ticket is up for renewal. Feel free to pawn for a nominal amount and deposit your valuables with us when you are away. Choose from our many pre-owned jewelleries and selected watches at competitive prices. Pay a deposit and pay for the jewellery in installments.